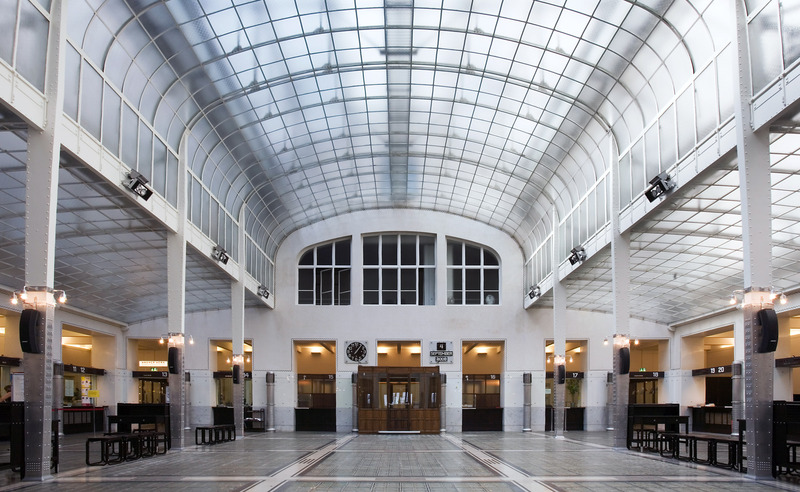 Realized in two phases, the first in 1904 – 1906 and the second in 1910 – 1912, the Postal Savings Bank was Otto Wagner’s first major building commission and allowed him to realize his “functional” principles of architecture for the first time. 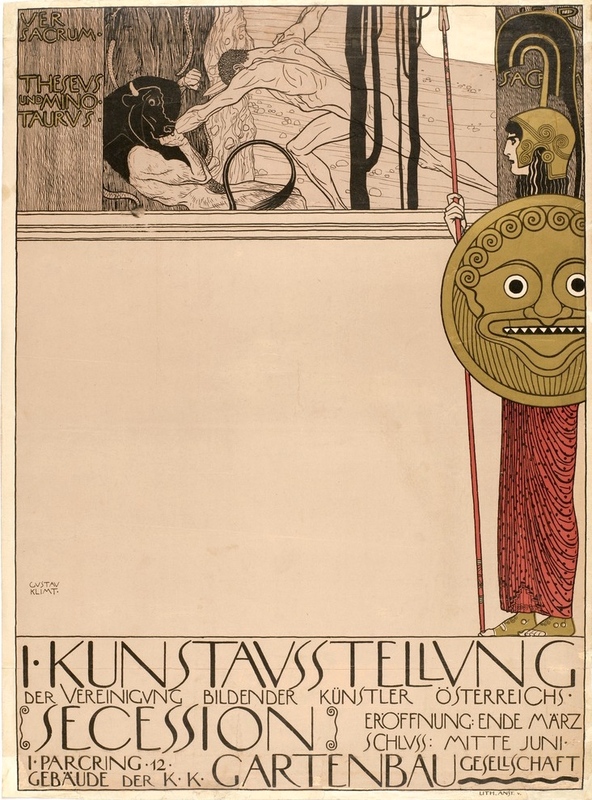 Wagner’s approach to design was closely tied to that of the Secession—a progressive group of Austrian artists, architects and designers who pursued artistic rejuvenation in combining quality building processes with new materials and technologies, and expressive modernist forms. Secessionist architects, including Josef Hoffmann and Joseph Maria Olbrich, were drawn to the idea of Gesamtkunstwerk—or the “total work of art”—in which all aesthetic elements are subordinated to the whole effect. In practice, this concept promoted artistic craftsmanship across a wide spectrum of disciplines and favored collaborative models of creation over individual authorship. In 1903, the craftsmen cooperative called the Wiener Werkstätte (Vienna Workshop) was developed by a group of Secessionists to facilitate this end. Bringing together designers of fashion, furniture and books, with architects, sculptors, painters, ceramists, and jewelers, the Werkstätte elevated the status of the craftsman while at the same time facilitating the unification of artistic endeavors in single fully-designed products. 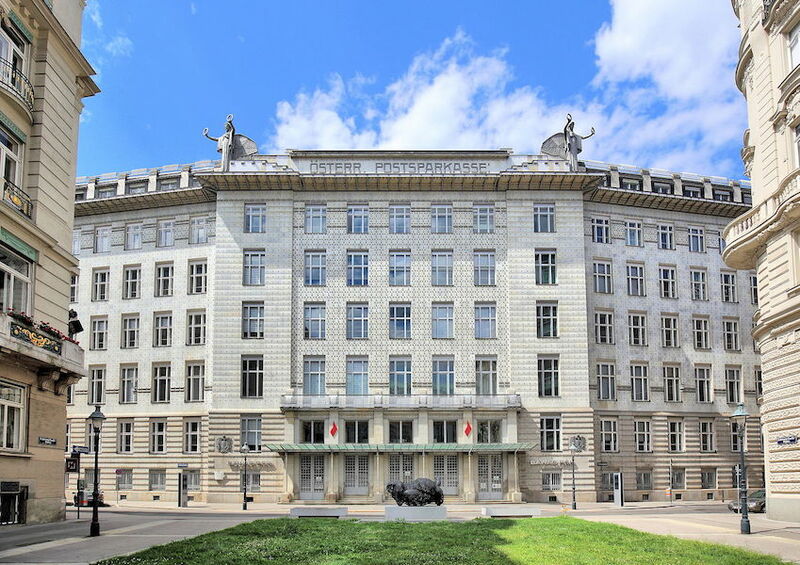 The Postal Savings Bank might well be considered a Gesamtkunstwerk, and perfectly epitomizes Wagner’s comprehensive approach to building design. Rising seven-stories and occupying an entire city block, the Savings Bank is one of the many monumentally-scaled civic buildings erected in Vienna in the years 1880 – 1910, a period in which the historical city was transformed into a modern metropolis. In plan, the bank is nearly trapezoidal. 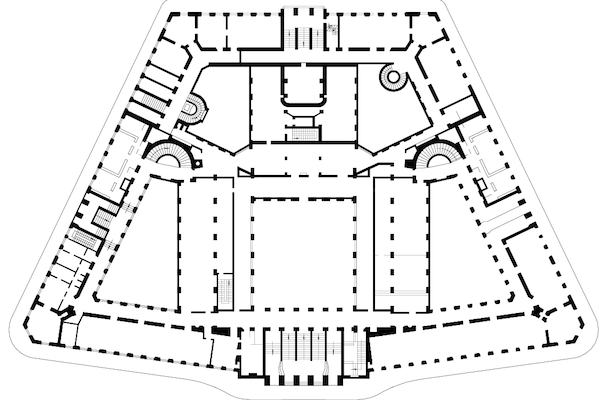 The rectilinear central block is occupied by the main banking hall, and is symmetrically flanked by triangular building wings, each perforated by a courtyard, in which dozens of bank offices neatly align along the structure’s perimeter. The linearity and systematized quality of the plan is echoed in the building’s façade—an austere yet artful interpretation of the building-as-machine. 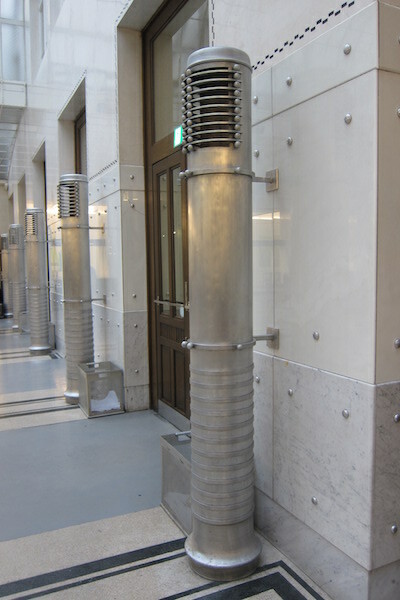 Here, thin profiled sections of white Sterzing marble are punctuated by aluminum bolts, precisely placed so as to create a mechanized aesthetic across the building’s surface. The functional necessity of the bolts is not only left unconcealed, but is actually emphasized as the façade’s primary ornament. But it is the bank’s interior—and in particular, the central top-lit banking hall (image near top of page) and adjacent office spaces—that most deftly asserts Wagner’s functionalist approach to total building design. Framed by a riveted steel superstructure, the central banking hall takes the form of a glass atrium, and every surface—wall, counter, door, window or pillar—bears the trace of the craftsman. In laying out the interior spaces, Wagner’s sought to maximize efficiency and minimize the amount of daily cleaning and future repair. Wide hallways, elevator lifts, telephone lines, and a pneumatic tube system were installed to facilitate internal communication, and within the offices, adjustable partitions allowed bank employees to reform their workspaces according to desire and need. Materials were selected due to their durability, economy and functionality. For the flooring, glass-block, porcelain tile and linoleum was laid over asphalt to create insulated, easily cleaned and long lasting surfaces. In high traffic areas, marble wall paneling thwarts wear and prevents the need for repainting, and aluminum hot-air blowers are not only sleek and sanitary, but occupy minimal floor space. 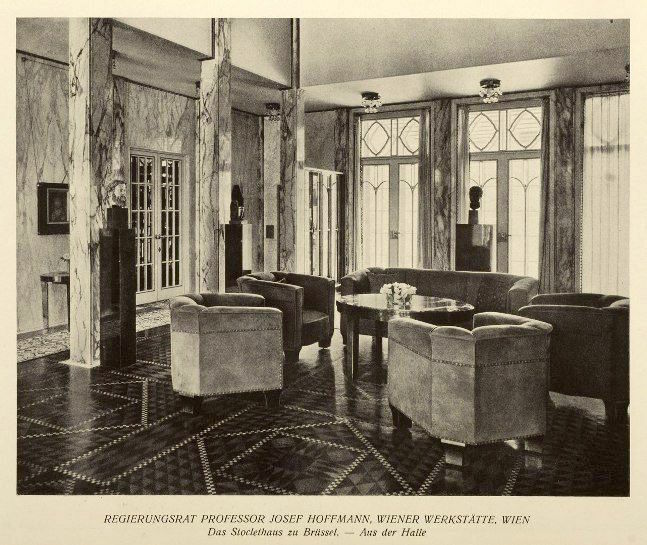 The bank’s furniture and detailing were also under Wagner’s purview and he developed an entire catalogue of standard-design furnishings that allowed for maximum economic and functional flexibility, depending on the respective location and use of each piece. With the exception of the chief executive’s office—where brass, velour and mahogany was used in the furniture—light fixtures were made of aluminum, porcelain and nickel, and the wood used in desks, cabinets, counters and chairs was artfully-treated beech. …its architectural and urban qualities and layout…illustrate [Vienna’s] three major phases of development—medieval, Baroque, and the Gründerzeit—that symbolize Austrian and central European history. The Historic Centre of Vienna has also maintained its characteristic skyline. Like no other part of [historical Vienna], the area surrounded by the Vienna Concert Hall (built in 1913), the Vienna Ice Skating Club (WEV) (established in 1899) and the InterContinental Vienna (built in 1964) documents the (architectural) history of Vienna in the 20th century. Urban development is a growing threat to cultural heritage around the globe. In some places, sites need strict protections to ensure that historically important structures are not built over or encroached upon by newer ones. However, in this case, UNESCO and other organizations are arguing for something more subtle: the preservation of the historic character of a particular neighborhood. The developer and city planners in Vienna are interested in economic growth, and value the history of 20th-century architecture as a valid part of the city’s story. Organizations like UNESCO (as well as local groups) would prefer to preserve the city as it looked in the nineteenth century and earlier. These differing points of view reveal how “preservation” and “heritage” are not stable concepts: they grow and change over time as societies themselves change. Balancing these ideas—and the tensions between history and modernity—while still allowing for growth is a difficult task faced around the world by city planners and preservationists, not only in high-risk zones, but in wealthy metropolises like Vienna, as well. Kenneth Frampton, Modern Architecture. A Critical History (London: Thames and Hudson, 1980). Nicholas Powell, The Sacred Spring. The Arts in Vienna 1898 – 1918 (London: Studio Vista, 1974). Otto Wagner, Modern Architecture, trans. Harry F. Mallgrave *Santa Monica: The Getty Center for the History of Art and the Humanities, 1988). Mark Wigley, “White-out: Fashioning the Modern (Part 2),” Assemblage 22 (1993), pp. 6-49. Christian Witt-Dörring, ed. Vienna Art and Design: Klimt, Schiele, Hoffmann, Loos (Victoria: National Gallery of Victoria, 2011). Cite this page as: Dr. Elizabeth M. Merrill, "Otto Wagner, Postal Savings Bank," in Smarthistory, November 28, 2015, accessed April 24, 2019, https://smarthistory.org/otto-wagner-postal-savings-bank/.